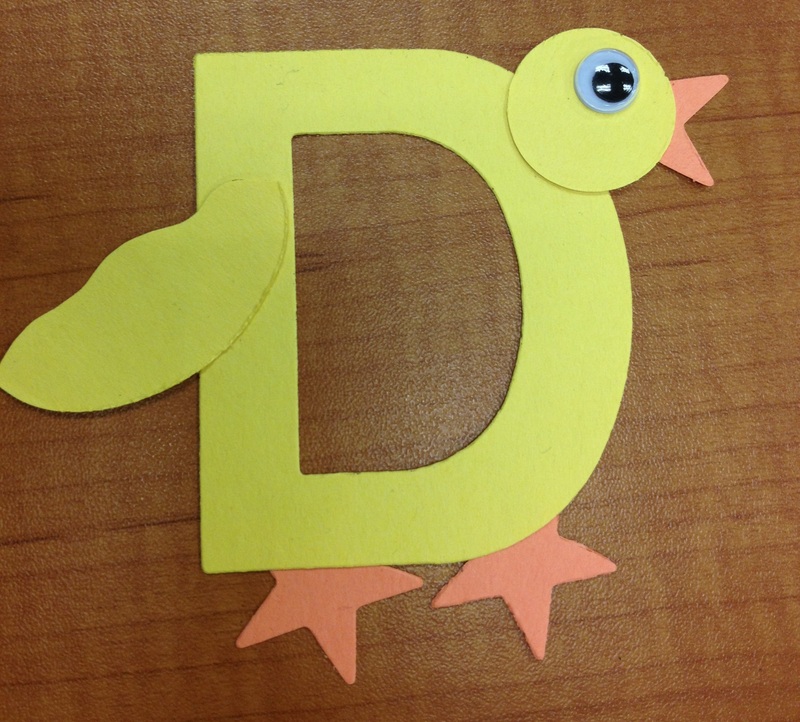 This week we did a duck theme in storytime! There are so many great books out there about ducks and the kids always seem to love them. I’ve been waiting and waiting to use the book Stuck By Oliver Jeffers along with the magnetic board I made. I made the book fit the theme this week because a duck gets stuck in the tree (I know, I know, it’s a stretch). Well, this week probably wasn’t the best week to use this. Storytime was insane! Lately I’ve been having a lot of younger siblings come with the appropriate aged kids (3-5yrs) and it just makes it tough because I want them to feel included too. And they want to do everything their older sibling does. Which is to be expected! So needless to say the room gets a bit…noisy. And none of the kids were really paying attention when it was their turn to put a piece on the magnet board. BUT they did seem to have fun, so I guess that’s all that matters! Soooo, to be used again at another time with a smaller crowd. Here is my handout! Here is the fun craft we did, the kids all LOVED it and giggled when I showed it to them. Last week my storytime was supposed to be a butterfly themed one but it didn’t happen. I had to cancel storytime because I didn’t have a babysitter for my wee little ones. I guess that’s motherhood 🙂 Anyways, I figured I would still share what I was going to do since I already had it all prepared. Here is the craft we were going to do. 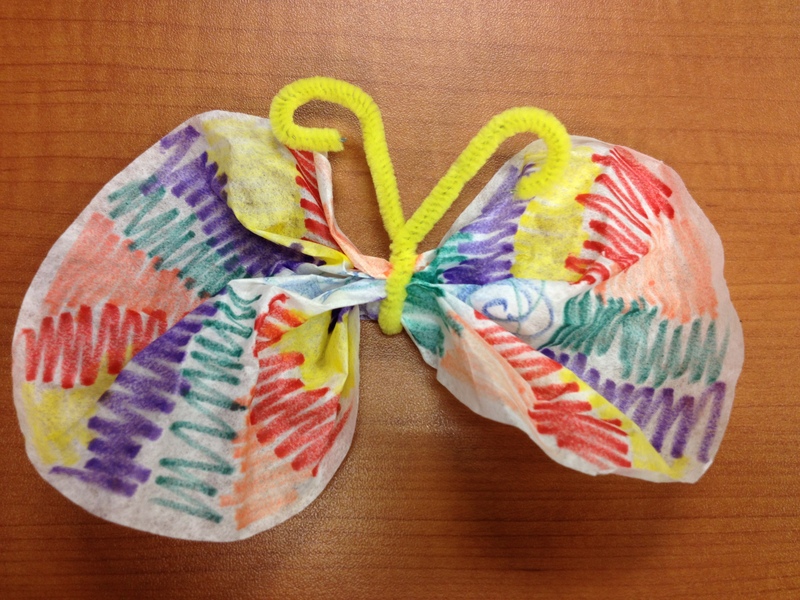 Coffee filter butterflies with a pipe cleaner, easy! 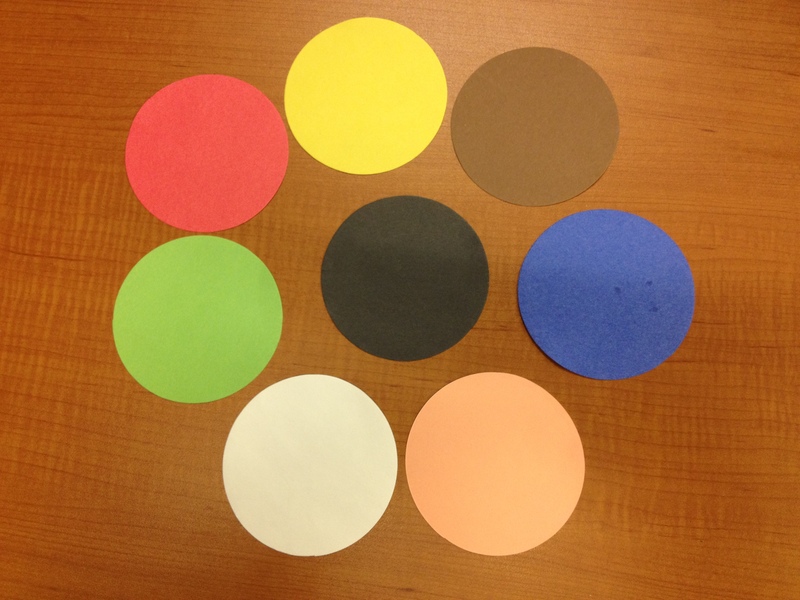 The Color Game is a fun song that I love to use in storytime. It is sung by the wonderful Jim Gill, who will be at my library in May 🙂 SO EXCITED!!! BTW, check out his new CD, it’s pretty sweet. It’s a rhyming song where you take different colors and put them on different parts of your body. I’ve found it’s best to use with older kids (3 and up) because it is a little fast paced and you really have to listen and pay attention. But I’m sure the littler ones would enjoy it too! What I like to do is hand out a little bunch of circles to each child that has a range of colors so they can use those to place on the different body parts. We sit on the floor and spread the colors out around us so we can see each one. “Take red, put it on your head. Take yellow, put it on your elbow” and so on. If you haven’t ever used the Color Game in ST, I urge you to try it! Enjoy! This week we did a color theme, one of my favorites! There are so many great books out there to fit this theme but I have some favorites I like to use. For our craft we did one to go along with the story, Dog’s Colorful Day. I tell the families to try and remember how he got each spot. It really gets them talking and interacting with each other. I love it! Here is one of my past posts about Dog and his colorful day.